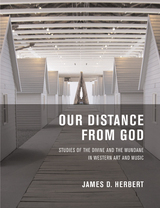 In this encounter between reflections on Christian theology and the history of art and music, James D. Herbert considers how specific works of art establish a relation between the divine and the earthbound audiences for whom the art was created. He looks at five case studies over four centuries: the architecture and artworks that glorified Louis XIV at Versailles, the interaction of libretto and music in Richard Wagner's Ring of the Nibelung, Claude Monet's enormous paintings of water lilies mounted at the Orangerie of Paris in 1927, the inaugural performance in 1962 of Benjamin Britten's War Requiem at the new Anglican cathedral in Coventry, and Robert Wilson's recent installation based on the Passion, 14 Stations. James D. Herbert is Professor of Art History and Visual Studies at the University of California, Irvine. He is the author of Paris 1937: Worlds on Exhibition (1998) and Fauve Painting: The Making of Cultural Politics (1992).